You wait ages for a trilingual dictionary of football, and then two come along at once (you can read about another trilingual football dictionary here). The team behind this new dictionary is led by Rove Chishman, a Professor of Linguistics and coordinator of the Graduate Program in Applied Linguistics at the University of Vale do Rio dos Sinos, Brazil. She is the leader of SemanTec, a research group specialized in computational lexicography and semantic technologies for information retrieval. Frame Semantics has been used for building lexicographic resources since the creation of FrameNet, showing that this theory is appropriate for language description. Inspired by this kind of initiative, the SemanTec group, from the Graduate Program in Applied Linguistics at the University of Vale do Rio dos Sinos (Unisinos), decided to face the challenge of building a frame-based football dictionary for non-specialized users, incorporating the notion of frame on a user-friendly interface. 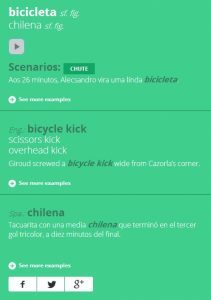 Field is a trilingual dictionary of football language guided by the notion of “scenarios”, which are an adaptation of Fillmore’s concept of frame. The main goal of Field‘s creators is not only to offer a word list, but also to organize words regarding their context of use, grouping them according to the situation in which they appear. Field has around 600 word entries, and approximately 40 scenarios; the website has optimized versions for tablets and smartphones. All scenarios are illustrated. In order to compose the list of entries, translate terms and collect examples, the Field team built three comparable corpora, each one containing around 1 million words extracted from football teams’ websites from Brazil, Argentina, Spain, United States and England. Among the computational resources used are AntConc and Sketch Engine. In the scope of Field, the notion of scenario is used to structure and organize the entries: football events such as SHOT, INFRACTION and GOAL are scenarios around which words and expressions are organized. This way, if users search for the word bicicleta (bicycle kick), they have access to information regarding the corresponding scenario (SHOT), as well as from the translation to English and Spanish. By clicking on this scenario, they will find other related words, such as bomba (screamer) and bico (toe poke). When accessing the dictionary for the first time, users can choose the desired language, which will also be applied to the lists of entries and scenarios. Field dictionary has two listings: one for words and one for scenarios. Concerning scenario entries, they represent events, match places or equipment used during the game, displaying all the words belonging to them. A definition and an illustration are provided for each scenario. Field enables all users, whether they are foreigners or Brazilians, to have access to football language from a purpose that stands out for showing this language in a non-traditional way. Moreover, it has a considerable potential to serve as a powerful learning resource for teachers interested in exploring football language in class, from real examples of usage. You can access Field for free here.